I’m a huge sucker for one dish or all-in-one meals, and I love food cooked on the BBQ even more! This dinner recipe idea combines both of these into one foil wrapped package. 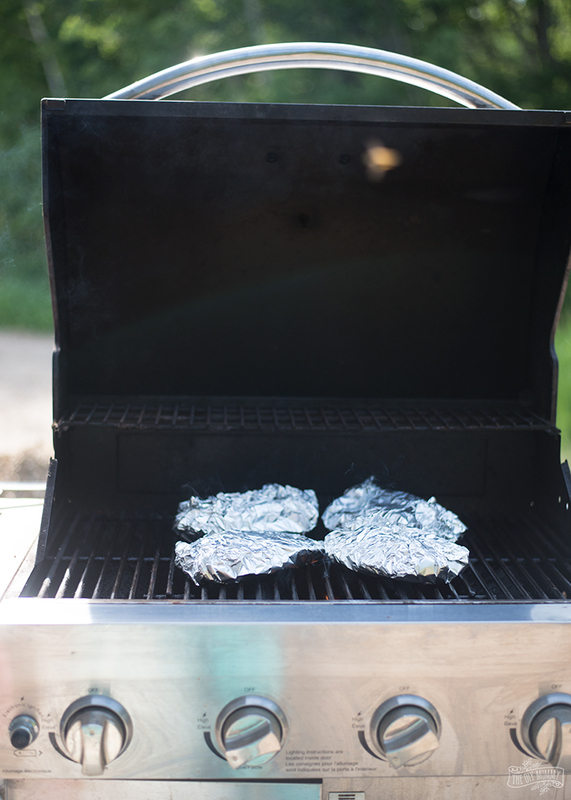 With the help of Esurance, let me share with you this easy prep BBQ chicken & veggie foil packets recipe plus some general back yard safety tips as you enjoy the summer outside! We love to use our BBQ as much as possible in the summer months. Summer is so short here, and cooking and eating outside is such a treat! Not only do barbecued foods taste delicious, but using the BBQ outside is a lot more comfortable than cooking in a hot kitchen. When firing up the ol’ BBQ, make sure you’re familiar with basic barbecue safety like ensuring your BBQ is away from your home, trees and fence. Make sure to clean your BBQ and BBQ tools well after each use. Did you know that you should never reuse a marinade and that you should refrigerate barbecued food promptly after 2 hours? You can find more barbecue food safety tips here. As you’re enjoying the great outdoors, also make sure that you’re taking precautions to stay safe in your yard and garden. Just like BBQ tools, garden tools and other tools need to be cleaned regularly in case of rust or other safety threats. If you have a pool, make sure you have it fenced so that small children are safe. Check your trees regularly for loose or compromised branches, and have a professional take care of them. Make sure to properly store paints and other chemicals, and ensure that power tools are unplugged and put away after use. Another way to enjoy a safe summer this year is to make sure your home is protected by getting your home insurance quote today from Esurance. Following safety measures like these will help prevent accidents in your home, but unfortunate mishaps often still occur! Esurance has policies designed to save you time, money, and hassle on your homeowners insurance and I love that you can manage your policy online. Click here to get your free home insurance quote today! 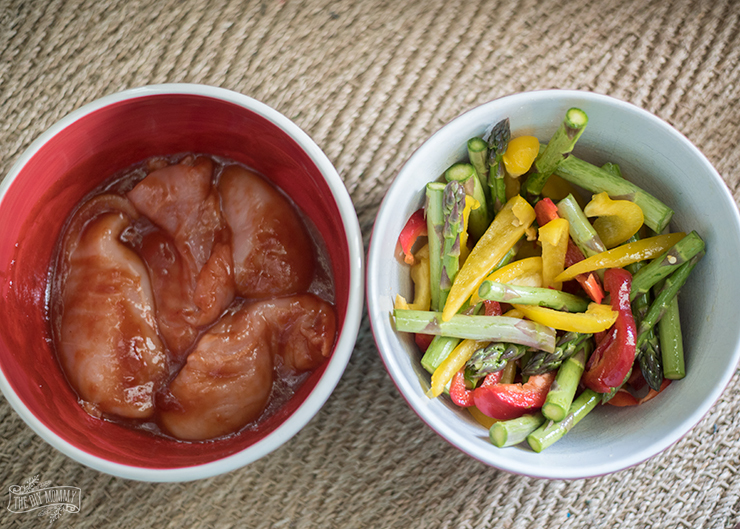 Here’s one of our current favourite barbecued meals: Easy Prep BBQ Chicken and Veggie Packets. One thing I really like about this BBQ recipe idea is that it’s so easy to prepare! I basically put the chicken in one bowl, and the chopped veggies in another, add the seasonings to each, mix, and then pop everything on tin foil. It’s all set for the barbecue! You can use whatever veggies you have on hand. This time, I’m using red and yellow peppers along with some asparagus. I love the fresh colour combo of these veggies! I use pre-made BBQ sauce to make the prep for this dish extra quick. 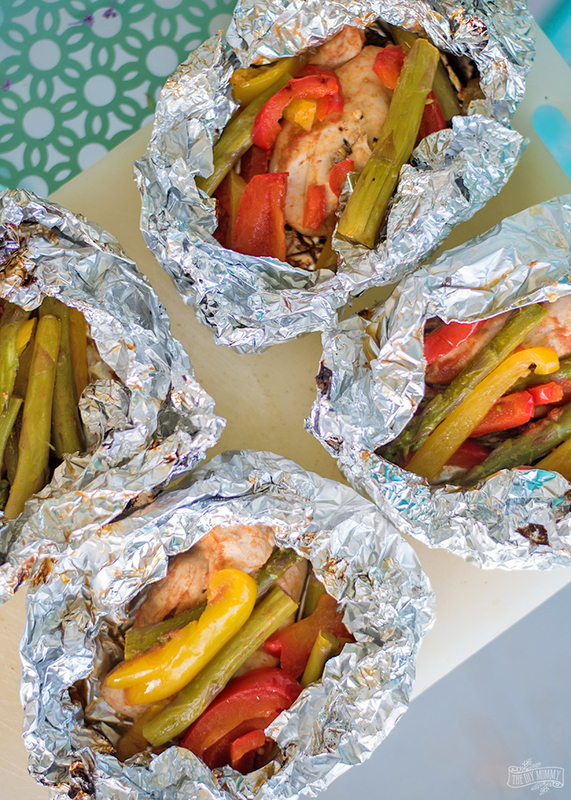 Make sure you double-up the tin foil when you make these so that your packets don’t fall apart when they’re grilling. I usually make one pack per person, but the kids usually share one. 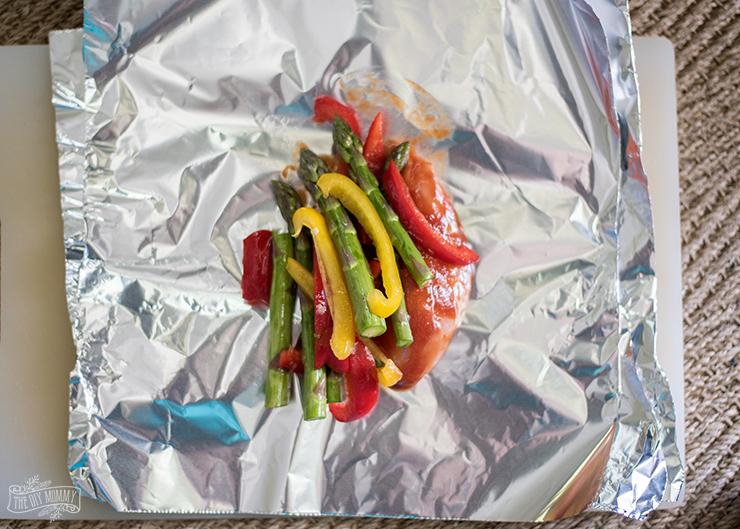 Here’s how to make Easy Prep BBQ Chicken & Veggie Foil Packets. 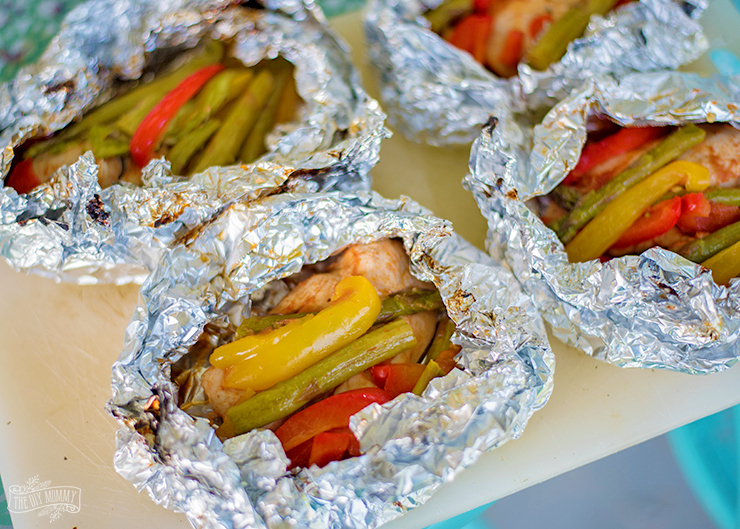 These simple foil packets contain chicken and fresh veggies - they're so easy to prepare and a great meal-in-one for the grill! 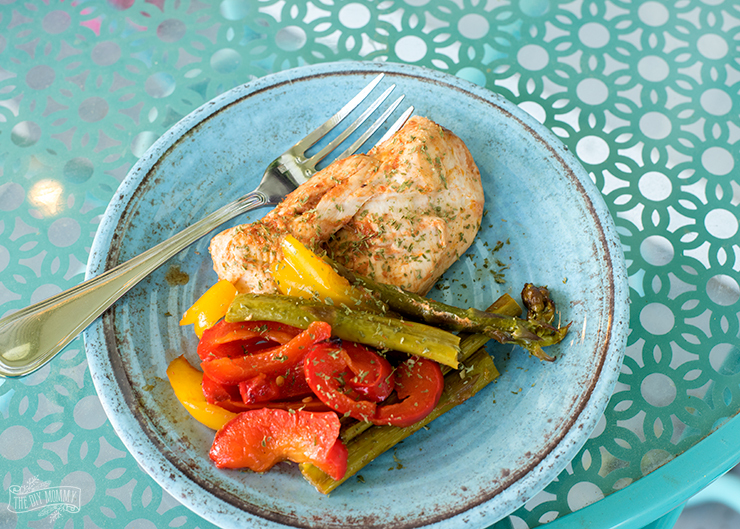 Mix the chicken breasts with ½ cup BBQ sauce in a bowl & refrigerate. In a separate bowl, mix the chopped vegetables with 2 Tbsp olive oil and 1 tsp sea salt. Cut 8 pieces of tin foil that are large enough to wrap & pinch around a chicken breast. Layer 2 pieces of tin foil together, and place one chicken breast in the center. Arrange ¼ of the vegetable mixture on top of the chicken. Wrap and pinch the foil around the chicken & vegetables. Repeat to make 3 more foil packets. Barbecue the packets on medium-high heat on a grill for 20-30 minutes. The packets are cooked when the chicken reaches 165 F.
What’s YOUR favourite BBQ recipe? Let me know in the comments below! This looks like it would be great my family cookouts! I love this recipe! I will try it soon. Thanks you for sharing!